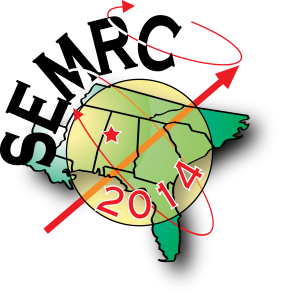 The 43rd Southeastern Magnetic Resonance Conference (SEMRC) 2014 will be held October 24-26, 2014 at The University of Alabama campus in Tuscaloosa, Alabama. Over a hundred faculty, postdocs, graduate and undergraduate students from the southeast region will participate in an exciting program in all areas of magnetic resonance including NMR, EPR, and MRI. The conference will begin at 5pm Friday evening and end with lunch on Sunday. 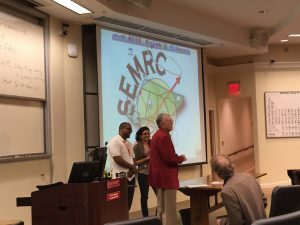 This year’s SEMRC has an emphasis on Biomedical Applications, Energy Conversion, Dynamic Nuclear Polarization and Magnetism in addition to contributed talks and posters from the full range of attendees. There will be awards for outstanding presentations by graduate and undergraduate students. Student travel awards and a low student registration fee encourage full participation by the future of magnetic resonance. The 43rd Southeastern Magnetic Resonance Conference will be held at Shelby Hall on the University of Alabama campus. The SEMRC has been hosted by Southeastern Universities and Research Labs for more than 45 years. Recent host institutions include Vanderbilt University, Florida State University, University of Florida, Emory University, Georgia State University, University of South Carolina, University of North Carolina, North Carolina State University and the National High Magnetic Field Laboratory. Metalloproteins and bioinorganic model complexes are investigated that are related to energy conserving systems. In focus are the water oxidizing enzyme of oxygenic photosynthesis and hydrogenases. We use a variety of different physical techniques to study them, including electrochemistry, X-ray crystallography, magnetic resonance, Mößbauer as well as time resolved optical and vibrational spectroscopy. Particular emphasis is placed on paramagnetic molecules studied by advanced EPR techniques. Development of new imaging technologies sensitive to the functioning of the normal and diseased tissues of living animals for accurate and efficient imaging of molecular oxygen concentration in tissues. The Center’s imaging technology exploits the unique, quantitative sensitivity of the EPR spectrum of soluble, injectable spin probes to crucial aspects of the fluids in which life processes evolve. Low-frequency EPR technology is used to maximize the depth in animal tissue to which the technique is sensitive. NMR- and MS- Based Metabonomics measurement of changes in an organism’s metabolic profile in response to external stimuli, genetic modifications, or as a consequence of presence or severity of disease. NMR-Based Structural Genomics is being used to determine the 3D structures of functionally uncharacterized proteins whose sequences are not similar to the sequence of any protein whose structure is known. With the structure of an uncharacterized protein, one can begin to understand its function according to structure-function principles. Utilizes advanced NMR techniques in studying the interaction of drugs with multiple-drug resistance transporters and drug-metabolizing UDP-glucuronosyltransferases. These proteins play major roles in cancer resistance, in neurological diseases (e.g. Alzheimer’s disease and Parkinson’s) and in mitigating the effects of environmental pollutants. Using human proteins isolated from genetically engineered yeast or bacteria, one goal is to develop structural biology tools to rapidly and accurately predict the effects of drugs and toxins before they end up in people. Research touches on a broad spectrum of phenomena in magnetic thin films and nanomaterials but remains centered on micromagnetics and magnetization dynamics. Ceria Nano-Shaped Particles Characterized by Fast-MAS 1H NMR: Water or Hydroxyl Groups? The role of carotenoids in photosynthesis, free radicals studied by electron spin resonance and electron-nuclear double resonance. Free radical reactions in proteins and other ordered but non-crystalline environments and on the application of pulsed EPR spectroscopy to determine the structure and function of enzymes, free radicals and materials. Investigation of the dynamic properties of magnetic materials. Developing the new experimental technique of magnetic resonance force microscopy to characterize the properties of individual magnetic structures with sub-micron dimensions. Except for the keynote speaker talks, all talks should be 20 minutes in length (15 minutes with 5 minutes for questions). Keynote speaker talks are 40 minutes in length (35 minutes with 5 minutes for questions). All posters should be no larger than 4 feet wide by 3 feet tall, and will be affixed to provided poster boards. Each board will be marked with an ID number. Please check the program for the ID number of your poster, after the program is finalized. Push pins will be available for affixing the posters. Posters should be 4′ wide and 3′ tall. All posters need to be mounted on the designated poster board. Congratulations to Umar Twahir and Dorsa Komijani for winning the Student Poster Awards. Professor Lowell Kispert presenting Umar and Dorsa with their Student Poster Awards at the business meeting. Please contact Lowell Kispert via email (lkispert@ua.edu) or call 205-348-7134 if you have any questions.  Payment of registration fees are handled through a secure website at The University of Alabama College of Continuing Studies. Choose your participation status (Full Participant, Student/Postdoc, or Guest) and click Add to Cart to continue. Registration will require you to create an account linked to your email address. Please ignore the “Select Personal Interests” section. Registration fees do not include accommodation, any meals not mentioned in the conference agenda, airport transportation, or any extra activities outside the specified conference agenda. Registration must be received by the conference on the dates specified below in order to receive the corresponding rates. *Rate requires an advisor letter to be submitted verifying participation status. Early registration is open until 9/26/2014. Late registration will begin on 9/27/2014 and will end on 10/16/2014. Registrations after 10/16/2014 will be on a space available basis. All on-site registrations must be pre-approved prior to arrival by contacting the Conference Coordinator at semrc2014@ua.edu. Students may apply for a student award when submitting their abstract. The abstract MUST be submitted along with a letter of recommendation from their advisor. The deadline for student award applications is 9/24/2014. Notification of student awards will be made by no later than 9/29/2014. Student awards are limited and do not cover lodging fees. Registration cancellations made or received on or after 10/10/2014, will receive a full refund. Registration cancellations made or received on 10/13/2014, will receive a 50% refund. There will be no refunds for cancellations made or received on or after 10/14/2014. Non-attendance does not imply cancellation. The Hotel Capstone is located on the University of Alabama’s campus allowing attendees to visit the campus on the way to Shelby Hall. The special rate is $115/day (+15% tax) for one King or two Queen size mattresses. Transportation has been arranged for attendees who reserve rooms at the Hotel Capstone. Other accommodations have been secured at the Hampton Inn Tuscaloosa – University under group code “SEM”. The special rate is $105/day (+15% tax) for one King or two Queen mattresses. The rates at both these hotels are valid if secured before September 24th, 2014. Tuscaloosa is located approximately 60 miles southwest of Birmingham, Alabama. The Hotel Capstone, which is located on campus, is at 320 Paul W. Bryant Drive Tuscaloosa, AL 35401. The conference will be hosted at Shelby Hall on the University of Alabama Campus. Driving directions to campus are found on the University’s visitors website. The most convenient airport is the Birmingham-Shuttlesworth International Airport (BHM), located 60 miles northeast of Tuscaloosa in Birmingham, Alabama. Transportation to and from the airport to the Hotel Capstone will be provided by the Conference Hosts. Transportation requests along with arrival/departure schedules should be emailed to semrc2014transportation@ua.edu. Tuscaloosa is a stop on AmTrak’s Crescent line; for more information, visit the AmTrak website. The city’s train station is located one mile south of downtown. Transportation to and from the train station to the Hotel Capstone will be provided by the Conference Hosts. Transportation requests along with arrival/departure schedules should be emailed to semrc2014transportation@ua.edu.